The book titled Viviliyam, Tirukkural, Shaiva Siddhantam Oppu Ayvu, written by one Deivanayakam, was published in 1985-86. It attempted to compare Bible, Tirukkural and Shaiva philosophy and concluded that Tiruvalluvar was a disciple of St. Thomas and that his sayings were only sayings from Bible. The writer had attempted to distort and misinterpret the Shaiva Siddhanta to suit his conclusions that all these works emanated from the preachings of St. Thomas who is said to have visited India in the first century AD. It was given to the Dharmapuram Math to issue a refutation. In spite of refutations from scholars through personal letters, Deivanayakam was unrelenting. Hence the Dharmapuram Shaiva Math had a book of refutation called Viviliyam, Tirukkural, Shaiva Siddhantam Oppaayvin Maruppu Nool prepared by its very able Tamil and Shaiva scholar, Arunai Vadivel Mudaliar, and released it at a function. The function organised by the Shaiva Siddhanta Sabha, was not very well publicised yet it had a gathering of over three hundred Tamil and Shaiva scholars. [2 ] The hall was packed to capacity. Justice N. Krishnaswami Reddiar, retired high court judge, presided. Tamil and Shaiva scholar M.P. Somasundaram, who made the opening speech, deplored that in independent India freedom and rights were being misused to such an extent that books denigrating the ancient religion of the land were allowed to be written. He said the Christian book was a bundle of distortions, misconceptions and misinterpretations of Tirukkural verses and Shaivite philosophical works to suit the conclusions of the author – namely that Christianity had influenced Tiruvalluvar and the Nayanmars. The book was mischievous in content and aim, he asserted. He commended Arunai Vadivel Mudaliar and the Dharmapuram Math for bringing out a refutation. Justice Krishnaswami Reddiar strongly criticised the modern tendency of publishing trash in the name of research. He said research must have an aim, a purpose, to get at the truth. Research was not meant to find evidence to denigrate an ancient faith. Research should not start with preconclusions or prejudices. Here the author’s motive was to show the superiority of Christianity. Religion was based not only on facts but also on faith and beliefs. The book had hurt Hindu beliefs. Justice Krishnaswami Reddiar quoted from the works of Sita Ram Goel and Ishwar Sharan and asserted that the visit of St. Thomas to India was a myth. He wondered how could such a book be published by [the International Institute of Tamil Studies, Adyar, Madras,] set up by the Government. It was a crime that such a book had been written and published and awarded a doctorate degree [by the University of Madras,] he said. This book by Tamil and Shaiva scholar Vidwan Arunai Vadivel Mudaliar is the refutation of Deivanayakam’s spurious doctoral thesis Viviliyam, Tirukkural, Shaiva Siddhantam Oppu Ayvu. Mudaliar’s refutation called Viviliyam, Tirukkural, Shaiva Siddhantam Oppaayvin Maruppu Nool was published in 1991 by the International Shaiva Siddhanta Research Centre, Dharmapuram, Tamil Nadu, India. Sarojini Varadappan released the book of refutation. Swaminatha Thambiran of Dharmapuram Math said the math head had, by personal correspondence with Deivanayakam, tried to put the facts straight. But he was unrelenting. Then a conference of scholars was held at Dharmapuram to which Deivanayakam was invited. Though he was present, he stood his ground. Then only, the Head of the Math decided to prepare this book of refutation and release it. 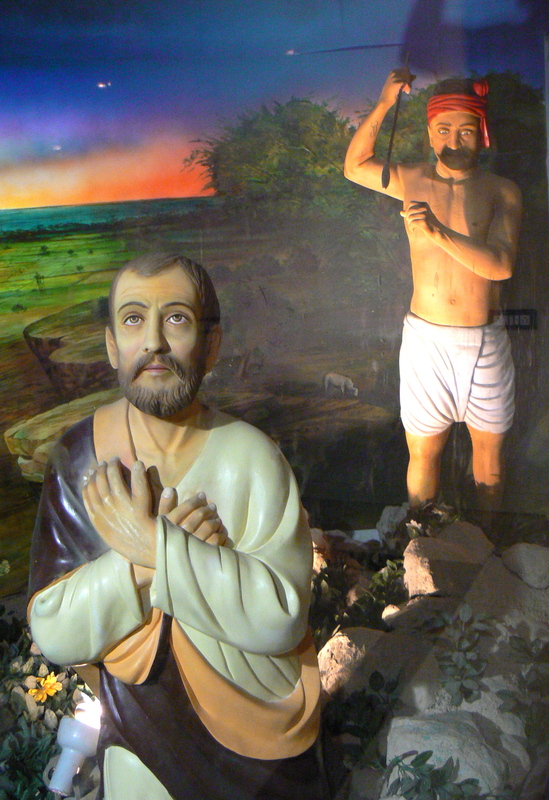 Dr. R. Nagaswami, eminent archaeologist, who had done some excavations at Santhome Church along with a Jesuit, quoted profusely from the writings of Jesuits and exploded the myth of the visit of St. Thomas to India. It was a Portuguese ruse to spread Christianity in India. He said Deivanayakam had taken the visit of St. Thomas to India as an established fact and, based on that, built his theory and conclusions. The fact was St. Thomas had not visited India at all. According to the evidence available, and books on St. Thomas, he had visited only Parthia, Dr. Nagaswami said. He said it was a sad reflection on the Institute of Tamil Studies which had published this book. It was shameful that Madras University had awarded a doctorate for this book without going into its merits. Vidwan Ambai Sankaranar said that the award of doctorate to the author of the book must be withdrawn as the author had not adduced any evidence as to how Tiruvalluvar was a disciple of St. Thomas. Vidwan Sundara Murthi pointed out how the Tirukkural verses were misinterpreted by Deivanayakam. T.N. Ramachandran said chronology had not at all been taken into consideration by Deivanayakam while comparing the works. Had he been a student of St. Thomas, Tiruvalluvar would have mentioned it, he said. Vanniyar Adigal said such books were being published taking advantage of the tolerance of Hindus and the liberty and rights given in the Constitution. He said a book by a Muslim showing the superiority of Koran over Tirukkural had also been published some years back. It was time for the Hindus to take cognizance of attacks on their doctrines, beliefs and sacred books. Eighty-five-year-old Arunai Vadivel Mudaliar, the author of the book of refutation, who was honoured with a silk cloth and cash presentation, said that an attack on his faith was like an attack on his mother and that compelled him to refute the book of Deivanayakam. Dr. M. Deivanayakam (he now spells his name Deivanayagam) and Dr. R. Arulappa have worked together on the christianization of Tiruvalluvar and the Tirukkural. In 1975 they co-authored the book Perinba Villakku in which Tiruvalluvar is represented as being Christian. That this important conference of Hindu scholars was not reported in the Madras editions of The Hindu and Indian Express is very revealing of the biased editorial policies of these newspapers. This article was originally published under the title “Tamil scholars assail Christian bid to misrepresent Tiruvalluvar as St. Thomas” inOrganiser, November 7, 1991, New Delhi. This entry was posted in apostle, christianity, hinduism, indian history, madras, media, religion, santhome cathedral, st. thomas, thomas the apostle and tagged apostle thomas, chennai, chennai media, christianity, hindu civilization, hinduism, indian history, madras, mylapore, portuguese, religious history, saint thomas, san thome cathedral, st. thomas apostle, temple breaking, thiruvalluvar, tirukkural. Bookmark the permalink.